SANTA ANA, Calif.— August 22, 2018–Goodwill of Orange County announced today it has been awarded a $30,000 grant from Bank of America to invest in its Thomas T. & Elizabeth C. Tierney Center for Veteran Services, Orange County’s comprehensive resource center for veterans and their families. 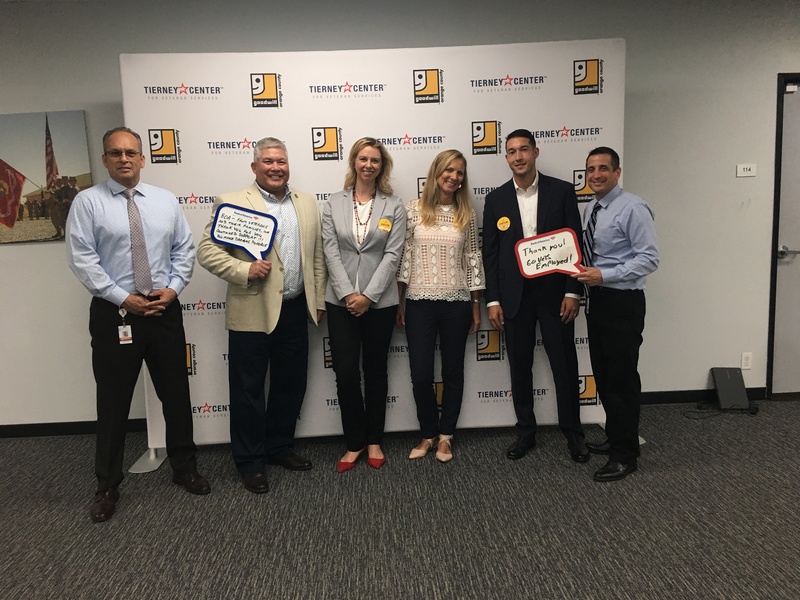 This is the third consecutive year Bank of America has selected Goodwill of Orange County for a grant supporting career transition, workforce development skills and other resources offered by the Tierney Center for Veteran Services. This funding will allow the Tierney Center to expand its services and support for former servicemen and women and their families, as well as conduct outreach to reach more of the local veteran population. Services available at the Tierney Center include vital job-readiness and job placement programs, career counseling, education services, housing assistance, healthcare and benefits, legal assistance, financial counseling, and women veteran services – all provided at no cost. The Tierney Center team includes many veterans who work one-on-one with clients to help navigate resources and make the process as easy as possible. Centrally located in Tustin, the Tierney Center for Veteran Services is within a two-hour drive for 60 percent of veterans living in California. The California Department of Veterans Affairs reports that Orange County has the third largest number of veterans of any California county, and that more than 275,000 veterans will settle here in the years to come. There is a huge need for streamlined veteran services in Orange County. Goodwill of Orange County is proud to partner with Bank of America to connect the unemployed and underserved with barriers to employment, and the training and education they need to secure and retain jobs with livable wages. Since 1924, Goodwill of Orange County has been in the business of helping people who are facing barriers find and keep meaningful employment. Founded on the belief that every person should have the opportunity to achieve the independence that work provides, Goodwill is most recognized for being the conduit where donated goods are sold in America’s favorite thrift stores to generate the revenue that provides the services to those who face employment challenges. Celebrating its 90th year in 2014, Goodwill of Orange County has supported hundreds of thousands of Orange County residents since its inception by creating and providing quality training and employment services to empower its program participants to be productive and independent. The nonprofit organization has dozens of programs that support this effort, including the Goodwill Rogers A. Severson Fitness & Technology Center, Orange County’s only facility specially designed for people suffering from chronic illnesses and physical disabilities; its global approach to serving veterans and their families, Goodwill of Orange County Tierney Center for Veteran Services, which helps former service members and their families find resources and services to meet and serve their unique needs, including housing, job placement, education, and wellness; and its Assistive Technology Exchange Center (ATEC), which provides access to more than 1,000 state-of-the-art technology devices for children and adults with disabilities. These are just a few of Goodwill of Orange County’s innovative programs that have served those facing barriers in Orange County for the past nine decades. In 2012, Goodwill was named one of Orange County’s Most Trusted Brands. To learn more about Goodwill of Orange County, visit ocgoodwill.org.